getting ready for a very busy weekend here at the inn. Speckled with candied ginger & a dash of nutmeg, we could barely wait to slather on some butter. 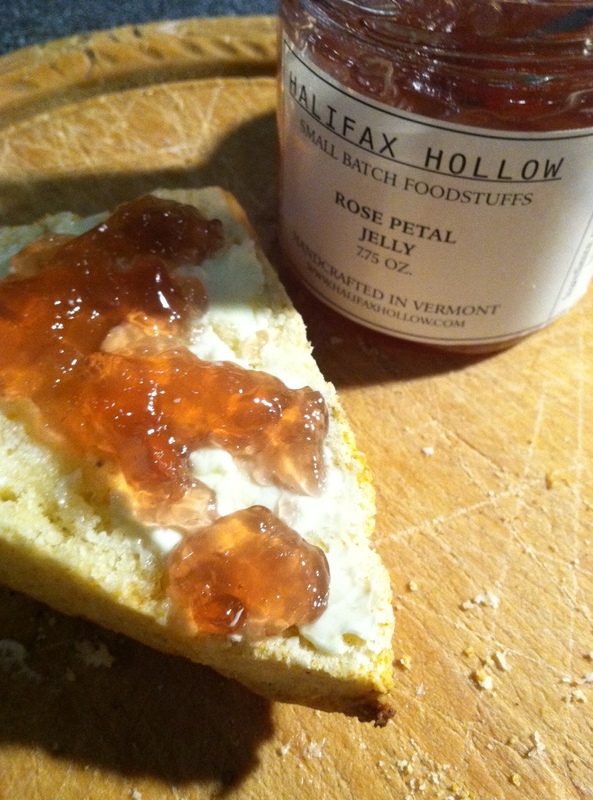 We decided to amp up the flavor with a precious home made rose petal jelly. 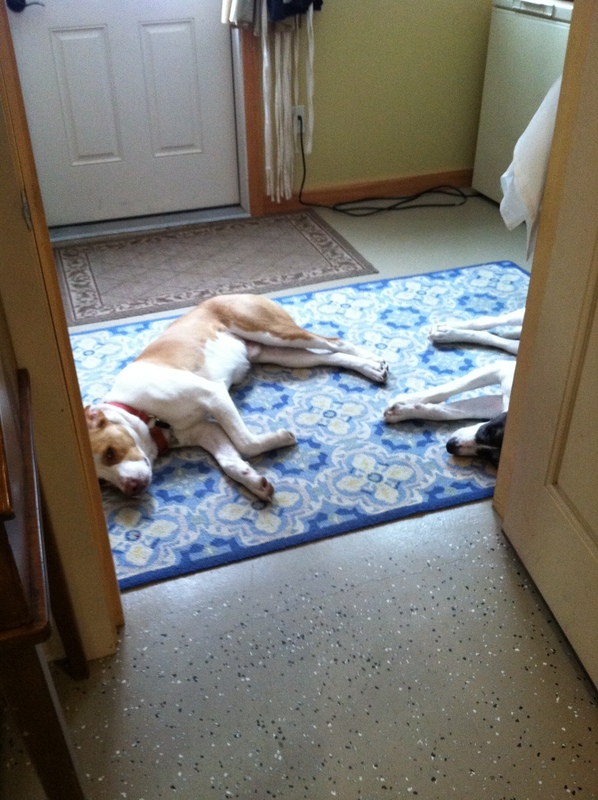 While Kate & I enjoyed a scone our pups, Ranger & Tito snoozed by the kitchen door, in hopes some crumbs might end up on the floor. Sorry boys, too good to waste a crumb. Combine flour, sugar, baking powder, nutmeg & salt in a large bowl. In a separate bowl lightly beat whipped cream. Slowly fold in 1/2 of the whipped cream into the flour mixture. Then add the remaining half. The dough will be a bit craggy. 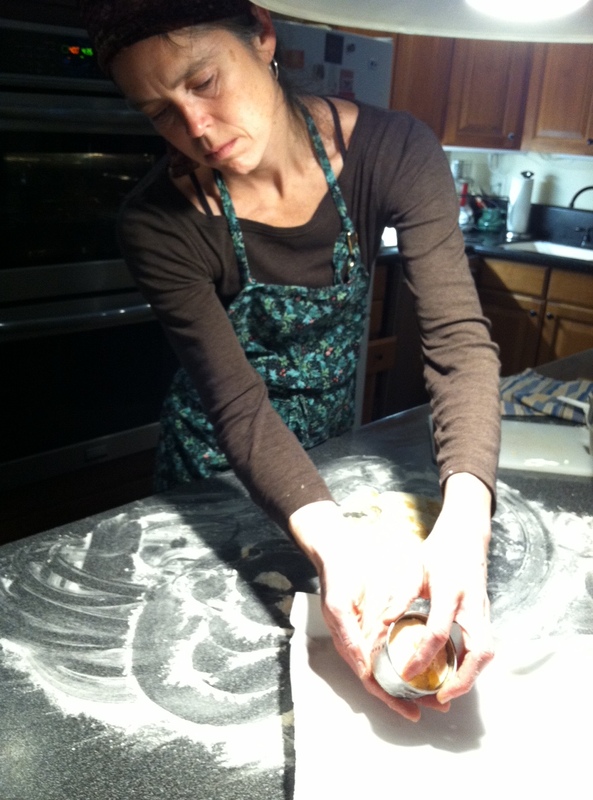 don’t worry, Once you empty the bowl onto a floured surface, pat the dough into a round disk, about 3 inches high. 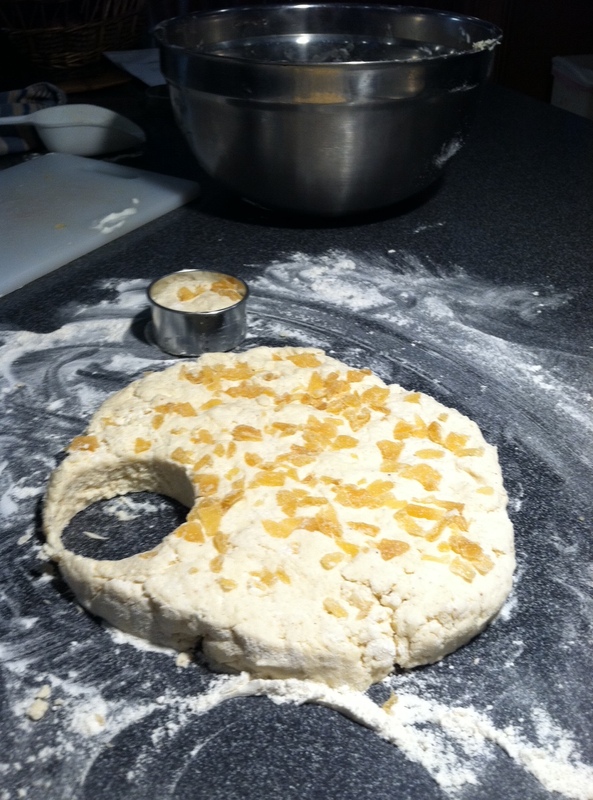 You may cut the dough into 8 wedges or use a biscuit cutter to make rounds. Make a simple egg wash with an egg & a tablespoon of cream. Brush onto scone tops before baking. You may also sprinkle sugar on top for an extra crunch, once baked. Bake on a parchment lined cookie tray at 400 for 15 ~ 18 minutes. I enjoyed a cup of coffee with my husband this morning, a ritual we always make time for. We sat in our Inn dining room overlooking the frozen pond and meadow beyond. The wind swept the snow in soft curls that spiraled up into large Vs and then disappeared. This dance went on for an hour and as one extinguished itself others would form. We watched like children as this performance, perhaps one of winter’s last, made us appreciate the beauty of the ending season. Breakfast is my husband’s favorite meal. Lucky for him, I love creating something healthy and nourishing. Morning always includes some fresh fruit, protein, and a pastry/bread item. On the weekends he enjoys whatever menu I am preparing for my guests. When it’s just the two of us, I can try out a new recipe, as I did this morning. This is a lovely variation on a baked German pancake. We topped it with our own Abbott’s Glen Maple syrup and toasted almonds. Melt 2 Tbs. of butter in an iron skillet. 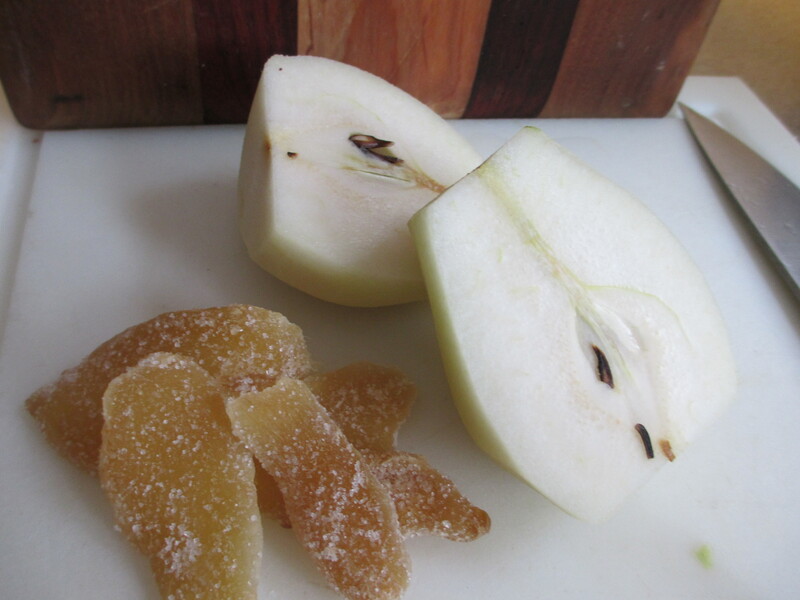 Add pears, brown sugar, cinnamon & candied ginger. Cook until pears are slightly softened. In a separate bowl, combine eggs, milk, flour, salt & extract. Whisk until smooth. Pour the batter over the pear mixture in the skillet. I use cast iron for oven baking as the pancake seems to puff higher. Bake for 20 ~ 25 minutes until puffed & golden. Carefully remove from the oven, handle will be hot, hot, hot! Top with toasted almonds & a Vermont maple syrup. Serves 4 with a nice side of sausage or hearty bacon.